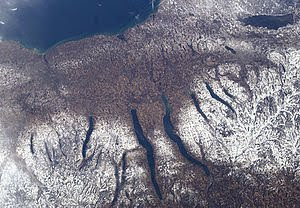 So many people I know have no idea about the Finger Lakes region...do you? It's in Central New York (locals do not appreciate it being referred to as Upstate), and it's about a 4 1/2 hour drive from NYC. There are twelve lakes, and over 100 vineyards. We went for an overnight last week, at the end of our trip to Canada, just Matt and I, and left Clara with her grandma in Binghamton...it was lovely. We stayed at the Mirbeau Inn and Spa in Skaneateles, which was lovely. Food was really stellar, as was the wine list (they turned us on to , and the staff were so thoughtful, informed, and professional. The spa was also really well done--lovely treatment rooms with fireplaces, a quiet waiting room with a foot soaking area, and really talented therapists. After we checked out, we went to the Skaneateles Bakery , and got a fresh homemade donut, and a delicious cup of Gimme Coffee . That place is so cute, and the food (and coffee) is so good--I just can't understand why nobody can do a version of this in Park Slope. We wandered around, checking out a couple of antique stores, and then it was time for lunch. We couldn't decide between Doug's Fish Fry (which our friend Jenny had said was amazing), and just getting a sandwich and soup at Skaneateles Bakery, but we had had enough of fried food, and went back to the bakery. Our short-rib sandwich was to-die-for. We also picked up some local vanilla yogurt there to bring back to Clara, from Wake Robin Farm, and I am kicking myself that I only bought one. We hit the road, heading to Ithaca, and on the way, stopped in the charming town of Aurora, which is on Cayuga Lake, and the home of Wells College. There are two really nice hotels to stay at, the Aurora Inn and the E.B. Morgan House (same owner--Pleasant Rowland, the woman who started MacKenzie-Child--she pretty much owns everything in town), although the E.B. Morgan House is the only one which is open to guests year-round. You can stay at the Aurora Inn in the winter, if you rent out the whole house. Both are so well appointed, and directly on the lake. I would definitely suggest coming here in the summer months, when the Aurora Inn is open, and has its restaurant open, because the only dining option in town is the Fargo Grill, which is really a burger/fries kind of place, and not the kind of place you'd want to eat more than once. You could always drive down to Ithaca and have a great meal at Moosewood Restaurant, but it's about a half an hour, and for me, at night, that's too far (if I really want to enjoy a bottle of wine). There's a cute cafe called Dorie's in town that serves Gimme Coffee, and is filled with Wells students. We liked it up there so much we want to look into renting a house for a week this summer. Since everything is spread out, it isn't the kind of place where you cover it all in a day or two. There are lots of great houses on the lakes, and vineyards to check out. We'd love to get to the Ravines Winery and Dr. Konstantin Frank's vineyard (the vineyard that really started the whole New York wine industry), and go swimming in what they say is some of the clearest (and cleanest) lakes in the country.